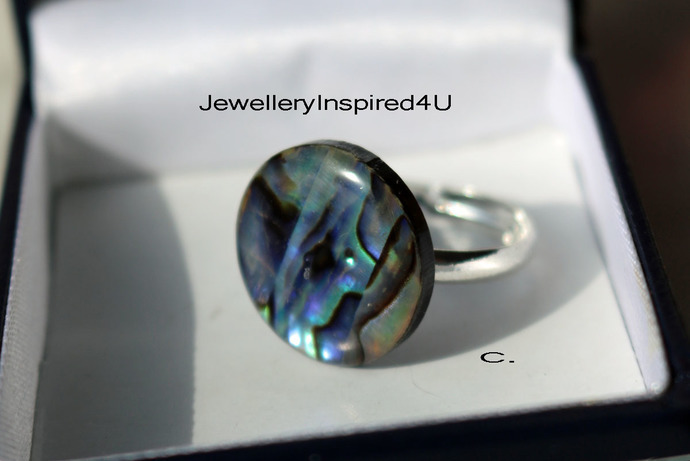 Paua Shell Ring. Featuring stunning colour ribbons of , Blue, Green Purple. Statement Ring. Sterling Ring 925. Adjustable ring. One of a kind shell ring in 4 distinctive patterns. Size 7.0 - 8. 0 Unisex. Handmade. Shell Ring. Stunning natural Paua (paw-wah) shell from New Zealand bring a lovely iridescent viewed at different angles in colours: blue, green purple, black with unique patterns only found there. The deep cold waters provide the natural conditions for these shells. The shell is in high regard of the Maori people is a treasure of God from the sea. 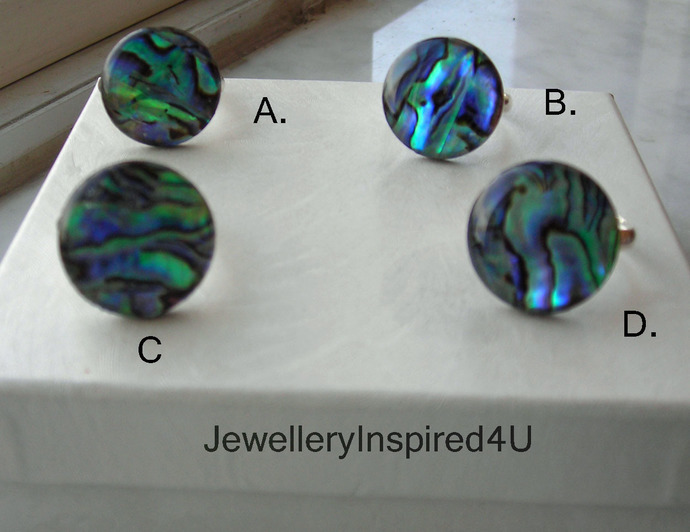 The Paua shell is a flat cabochon with a black backing adhered to a sterling silver (using non toxic commercial adhesive). adjustable ring which will accommodate size 7.0 in the closed position extending to size 8.0. One size will fit most and is suitable for unisex. The cabochon measures 0.75 inches - or 19 mm in circumference (the same size as a dime). Please see the photo's: The first is featuring ring A. The is also a grouping and you may select from the drop down menu A, B, C, D.
**If you do not know your ring size (the ring should not be tight or too loose). Use a string or thing strip of paper and measure the distance around the finger at the widest part (knuckle). Measure this in cm using a ruler. E.g. 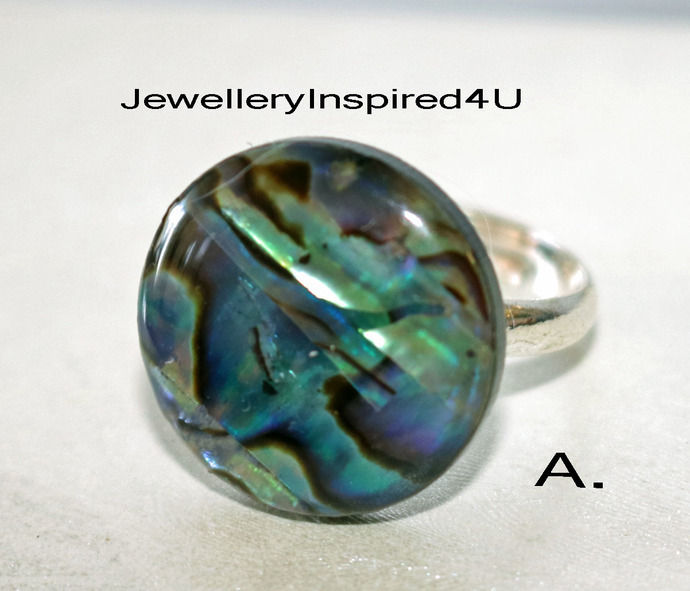 Ring size 7.5 is determined as: There are 10mm in every centimetre, so 17mm = 1.7cm 10 mm = 1 cm so 17 mm = 1.7 cm. 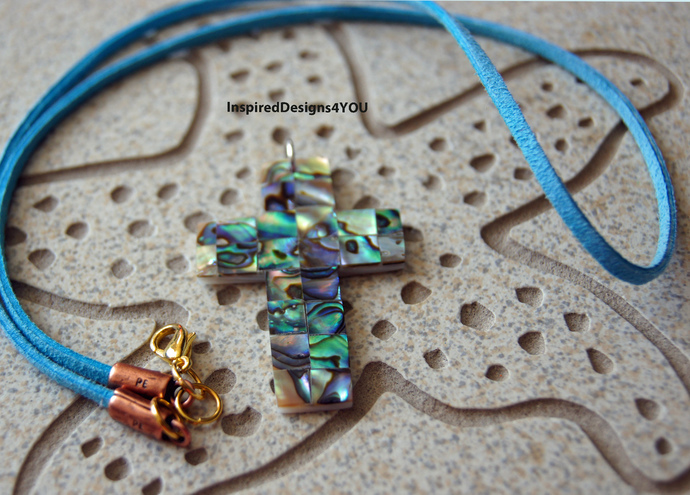 Other items available: Cross Paua Shell with sterling silver chain. Shipping: Kindly provide a phone number and email, this is required by Canada Post. Please note shipping is regular post via Canada Post for domestic and international orders, this is not tracked. Other options available Express Post and Expedited for domestic and U.S.A. shipping I recommend this option as it guaranteed on time delivery with tracking. Thank you, if you have any questions we are here to help...send me a convo.